If we look at Minsky’s writings on finance, they cover the details of the evolution of the financial system historically. (One of his earliest papers was on the evolution of the fed funds market in the 1950s). If one is familiar with fixed income markets and finance, his argumentation is easy to follow, and one can easily draw parallels to contemporary developments. (This probably explains his popularity among market commentators.) Unfortunately, the mass of details is presumably harder to follow for people less familiar with these markets. Changing behaviour of the financial system poses severe challenges to macro models. We can view macroeconomic models that simulate all aggregated flows in the economy as being akin to video games. (Admittedly, somewhat boring video games.) The Financial Instability Hypothesis can be interpreted as the financial sector is changing the rules of the game while it is underway. Minsky discussed this in the essay “Central Banking and Money Market Changes,” (originally published in 1957) which was reprinted in Can “It Happen Again? : Essays on Instability and Finance . In his example, changing practices in the U.S. banking system allowed banks to reduce the reserves needed to support credit growth, allowing the money velocity/interest rate curve to move. Figure 1 (based on the figure on page 106 of Can “It” Happen Again?) depicts this shift: the curve to the left was the original velocity/interest rate relationship, which jumps to the curve to the right in response to rising interest rates. This meant that the old estimated relationship between interest rates and velocity has broken down. If we put aside the usefulness of velocity in analysis (I am skeptical), we see that estimated model properties will shift because of innovation. The tendency for increasing credit risk is tied to the somewhat vague concept of “liquidity.” Within aggregated models, all transactions for a period happen simultaneously, and the models function without “money” – actors just need to transact so that all flows net to zero value. This is not how the real world function, there must be some form of a liquidity buffer. Some models will create an instrument “money,” and insist that actors have a certain level of this instrument to support transactions. However, this does not match reality, where various credit instruments can be used to undertake transactions. Even if the banking system is used for payments, there is no need that the volume of payments bears any relationship to the size of bank deposits as measured at the end of the day. Increasing reliance on credit instruments for transaction settlement raises the fragility of the financial system – which is inherently hard to model. The evolution of the financial system would not matter if credit decisions were largely constrained by borrower behaviour. This is the usual tactic of neoclassical models, which assume a “no Ponzi” condition, and households follow some optimising strategy. However, it appears that the lending side is extremely important for the determination of borrowing levels. The figure above depicts the results of the experiment conducted by Canadian policymakers starting the late 1999s. 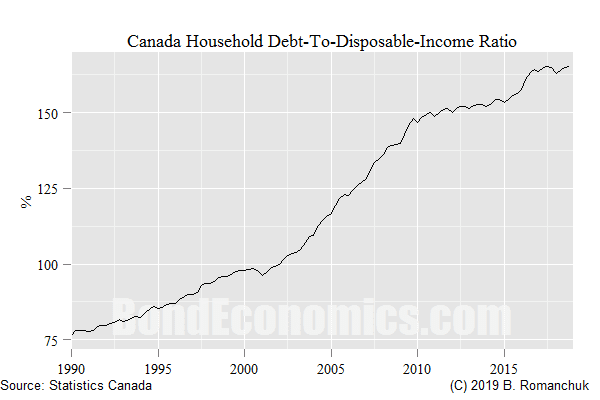 The regulations controlling borrowing amounts for households were relaxed, and the debt-to-disposable income ratio accelerated upward (after the effects of the technology sector crash faded). Although the downward trend in interest rates helped reduce debt service, this is a classic example of credit growth being induced by relaxed lending standards. We will now finish off with a number of topics that are related to the changes in financial system behaviour, but are secondary to the main thrust of the argument. Why Do Financial Innovations Happen? One question is: why do financial innovations occur at all? The explanation is not at all obvious, if one starts from traditional discussions of the banking system. It is entirely possible for almost all credit to be provided by conventional banks (equity either needs to be provided by individuals or via markets), with central government bonds acting as “position making instruments” (Minsky’s term for instruments used for liquidity management). Many countries had (or still have) such banking-dominated financial systems. The reality is that traditional banks have limitations. Large borrowers (like multinational corporations) pose concentration risks to banks, and so they can often only be funded by a consortium of banks. Alternatively, industrial groups are grouped around a funding bank, as was the case in the Japanese keiretsu (or convoy) system. The keiretsu system was effective a growth strategy, but problems build up over time because of moral hazard (see the discussion in this paper). The implication of this balance sheet structure is straightforward – the bond markets have either to fund private sector borrowing either directly or indirectly. The “shadow banking system” evolves in a way to match the actual borrowing needs of the private sector to fit within the constraints of bond financing. For example, asset-backed securities allow small loans to be bundled into a package that can be traded in the wholesale markets. The other challenge – which ultimately causes a significant portion of distress – is the mismatch between the great desire to hold money market maturity instruments versus the small number of borrowers who wish to borrow at such tenors. The banking system is able to deal with this mismatch because of being backstopped by the central bank; the non-bank sector naturally lacks such a backstop. Credit lines from banks are used to backstop commercial paper, but those lines are expensive. Eliminating that expense explains one of the drives behind financial innovation – at the cost of vulnerability to runs. Finally, a good portion of innovations appears to be a way to avoid regulatory costs (such as capital rules) that are typically imposed after a financial crisis. Can Regulators Stop Such Innovation? 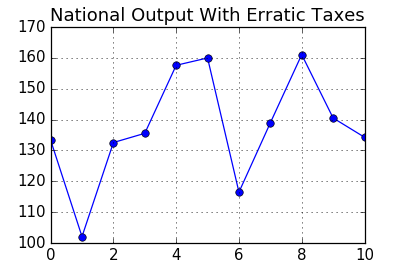 The last factor explains why this rather technical topic is controversial. The argument that financial sector evolves to nullify regulation is a view that draws the dislike of a good portion of the political spectrum. The free market right (particularly economists working at banks) are offended by the suggestion that financial innovation is anything other than a benefit for society. The technocratic centre (particularly employees of regulators, such as central bankers) can be offended by the suggestion that regulators are hapless Keystone Kops. Meanwhile, the left is offended that this view is defeatist, if not hidden support for an agenda for deregulation. Is it possible that we can reach a steady state, with regulation perfectly balanced so that all financial activity follows the spirit as well as the letter of the rules? Historically, this has not happened. The profit incentive in the financial sector – plus the political attractiveness of looser lending – overwhelmed regulators. (Any politician that ran on a platform that voters would lose access to easy mortgage credit is likely to have a short career.) We would need some major structural changes in attitudes toward commerce before regulators have an ability to stand against these forces. This flexibility is associated with the capacity for lending. Once again, the circular nature of financial flows in the model implies that there are no constraints on the size of lending flows in any period. 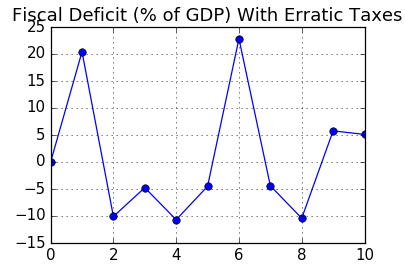 The above chart depicts the fiscal deficits (as a percentage of GDP) for the previous model with erratic tax rates; the flows in a period do not have to be close to that of the previous period. (There is the concept of loanable funds, which used to popular in classical economic accounts, which acted as a constraint on lending. Since the idea of loanable funds makes no sense within national accounting concepts, I cannot explain how it was supposed to work.) It should be noted that there could not be a nominal limit on debt growth, since debt growth typically keeps up with nominal GDP growth in high inflation environments. Nevertheless, modellers need to find conventions for behaviour that keep debt growth at plausible levels. A standard way to constrain the financial sector is to impose capital or reserve constraints on banks in the model. This generates plausible-looking dynamics, and the constraints within the banking sector influence model outcomes. The problem is that we cannot take the model constraints literally, except for financial sectors that are dominated by traditional banking. Capital requirements are more plausible. One issue to note is that regulatory capital is not just equity – there are various subordinated debt instruments that can be included. More importantly, the non-bank financial system does not face capital requirements for the expansion of its balance sheet. The move to bypass bank capital requirements via securitisations is an important lesson. Attempts to constrain certain forms of lending make them uneconomic, so the private sector moves to alternate arrangements. A model that models the financial sector as a single aggregate with a fixed capital requirement will only work until the point that alternate financial arrangements take over (e.g., securitisations). As such, we need to disaggregate the financial sector, and allow multiple financing instruments. This can be done in stock-flow consistent models, albeit with cumbersome algebra. However, we run into an immediate problem: actors in the model should be immediately aware of all financing options, and exploit each to their maximum potential immediately. Financing practices would not naturally evolve; the financial system has reached full maturity immediately. If one wanted to emulate the growth trajectory of new financing structures, the regulatory burden would need to limit their market share at the beginning, of the simulation, and then relax the burdens. This is actually the opposite of the real-world experience, where novel financing schemes are progressively clamped down on by regulators. If one wanted to simulate this evolution in a mathematical model, a complex financial sector would be required, probably using an agent-based model. (This complexity would make the model impossible to fit to data, but it might be useful as a theoretical construct, or even in a video game.) All possible financing schemes would defined by some parameters, and the model would start with a small number of them. As time passes, new potential modes of finance are developed. Since adopting new financing practices requires costly research, take-up the new modes will be limited. The success of units using the new modes of financing will spawn copycat behaviour, and so its market share grows. Creating such a model using aggregates would be extremely difficult, but it would not pose too much added complexity for an agent-based model. The plasticity of behaviour would make drawing any conclusions from the model awkward, although it may be useful for seeing how far predictions based on measured aggregates can depart from reality in an environment of financial innovation. In conclusion, evolution of financial system behaviour amplifies the instability created by changing borrower behaviour. Since the financial sector needs to accommodate aggressive risk-taking by borrowers, the financial evolution cannot be ignored, even though it poses even greater modelling risks. Finally, one should not approach the Financial Instability Hypothesis as justifying being permanently bearish: the Financial Crisis of 2008 is not going to repeat every few years. People and institutions learn from traumatising events – such as the Great Depression and the Financial Crisis. From the 1966-2008 period, a certain amount of paranoia was justified: the financial sector did suffer periodic disruptions. (Note that this overlaps Minsky’s career, so even if one detects a paranoia about instability in his views, he was correct.) However, they were generally not enough to cause global crises that forced a wider re-think of behaviour. Although memories in finance are short-lived, behaviour is still relatively cautious. (Pockets of zaniness exist, but these are away from the wholesale funding markets, which is what matters for the economy.) One could argue that the biggest risks that hang over the system are the only sectors/actors that did not have a forced reset after the Financial Crisis (and the follow up euro sovereign crisis). The author cannot pretend to know whether those sectors are due for a reckoning. Although some look worrisome, it is hard to find policymakers who are complacent about such risks in 2019. [iii] I discuss bank reserves in Chapter 13 of Abolish Money (From Economics)! As I moved through your logic, I found myself introducing the practice of gaining co-signatures. By co-signers, I mean those who agree to take some risk of repayment should the true borrower default. Examples of co-signers can be found on student loans (occasionally), home mortgages, and consumer loans (occasionally). I suspect that syndication of loans or resale of loans often also carries an element of co-signature. In common, these risk commitments will exist as off-balance-sheet (or otherwise minimized) commitments. If we modeled this in an aggregated model, we could introduce a spreading element of increasing risk assigned to vulnerable sectors. I should add that I think co-signers as a group would have a declining ability/willingness to perform as a recession deepened. In a model, the risk factor used would need a historical reference and would naturally vary. As an aside, I would say thanks for two interesting posts on the Financial Instability Hypothesis. You’re welcome. The footprint of co-signers is not enough to show up in an aggregate model, other than the case where governments have underwritten mortgage risk (CMHC in Canada).